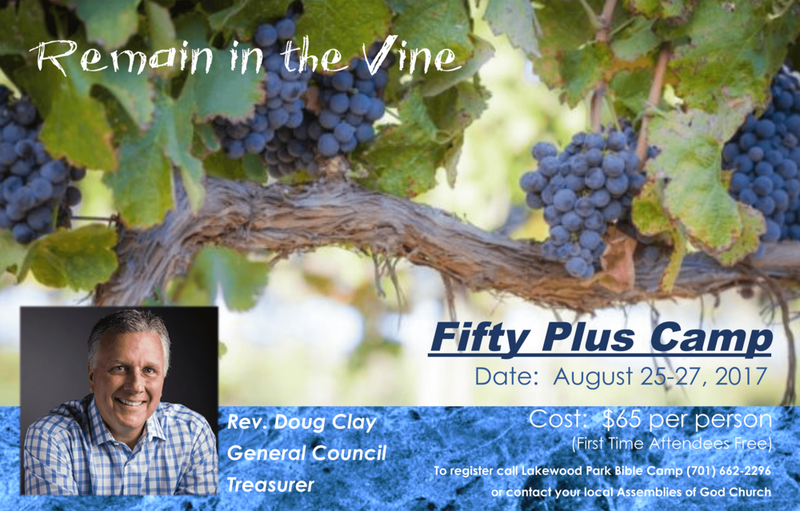 Our annual 50 Plus Camp takes place every August at Lakewood Park Bible Camp. Lakewood Park is a great place to find relaxation, establish new friendships and renew your spiritual life. Our theme for this year is “Remain in the Vine.” With Rev. Doug Clay, from the National Resource Center of the Assemblies of God as our main speaker we look forward to a refreshing time together. It is our desire that everyone enjoy the ministry of The Word, the activities, and of course the fellowship! Fifty Plus Camp offers a wide variety of activities for the active at heart as well as for those that want to sit back and relax. See the information below for more details!